Ruth Evans was, in fact, born in Lowell (at Lowell General Hospital) before going home to a neighboring town. 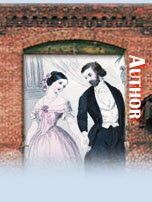 She grew up in a large, Victorian house filled with books, cats, one dog, two parents, and five siblings. Her two older sisters taught her to sew when she was still in elementary school, and one of them got her involved with Contra dancing when she was barely out of junior high. 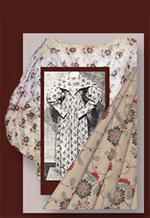 From those early days of sewing, working with textiles has been a constant in Ruth's career. Her path has taken her from fourteen-hour days as a costume apprentice at North Shore Music Theatre, to clothing and textile classes at Michigan State, to two decades (and two thousand gowns) as a bridal seamstress, to a decade with a textile company. 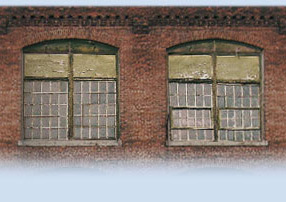 She also produced the Mill Girl dress replicas that are used for display at the Boott Mill Museum, and spent a season volunteering in the Children's Loom Room at Lowell's Industrial History Center. Prior to her recent retirement, she was a highly respected prototype stitcher for a local manufacturer, part of a team of developers and problem solvers guiding projects from the drawing board to the factory floor. 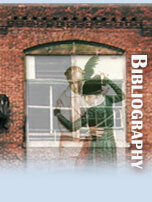 Ruth and her co-researcher, Charles Worsley, were accomplished dancers—each in their own right—long before they were husband and wife. Ruth began English and American Country Dancing in the 1970s (and danced onstage at the National Folk Festival when she was 16), Middle-Eastern dance and Historic Ballroom in the 1980s, and Modern Ballroom in the 1990s. 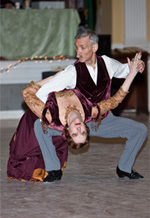 Charles has been participating in various forms of Country Dance and Ballroom Dance since the 1980s. 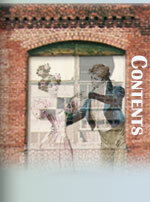 He has been researching and performing Period Ballroom for over thirty years. 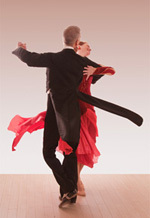 Together, they have competed in Modern Ballroom (championship level), and have showcased several "Then and Now" choreographies that transition from the early forms of a dance to the modern one. 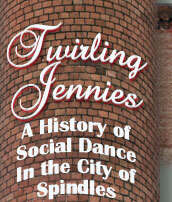 In Twirling Jennies: A History of Social Dance (and other mischief) in the City of Spindles 1820–1920, Ruth's years of experience with fabric and its manufacture combine with a lifetime of social dancing, a writing background, graphics certification (to handle images and layout), and a willing research partner to make her uniquely suited to tell the story of dancing in early Lowell. Her empathy with the Mill Girls—both on and off the dance floor—is undeniable. Ruth once heard a Lowell Park Ranger speak about making history relevant, about helping people to identify with the Mill Girls and their contemporaries. That goal was never far from Ruth's mind while writing Twirling Jennies. Nor was keeping the book lively and full of intriguing discoveries for the reader! 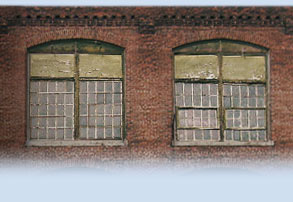 Ruth and Charles were married in 1999 and moved to Lowell ten years later. They have since gained something of a reputation around town as "the dancers." Various offspring and grandchildren—all within an hour's drive—help enrich their lives. 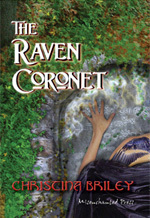 Ms. Evans' fantasy novel, The Raven Coronet, is published by Misenchanted Press under the penname, Christina Briley. 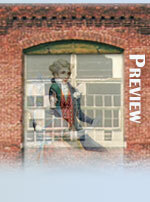 To see a preview, click the image at right. Pictures, from top: Ruth's baby photo taken at the Bon Marché on Merrimack Street; A montage of photos and fabric of the 1830's Mill Girl Dress; 2010 photo by Moses Goddard; 2011 photo by Ella Carlson.